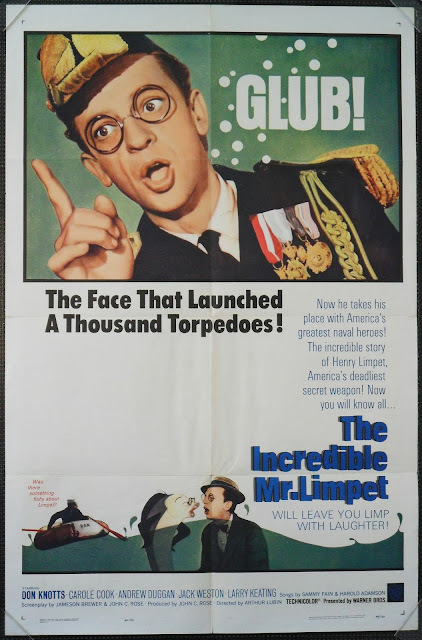 Original print ad for "The Incredible Mr. Limpet"
People know Don Knotts as Deputy Barney Fife on "The Andy Griffith Show," or perhaps as the TV Repairman in "Pleasantville," or maybe as the star of slapstick comedies like "The Ghost and Mr. Chicken." Perhaps you fondly recall his performance as the Mayor in the much later animated Disney film "Chicken Little," or as Mr. Furley in "Three's Company." There are, in fact, a lot of reasons to remember Don Knotts. However, most people don't know that Don Knotts was a decorated serviceman during World War II, or that he was a marksman, or that he was a skilled ventriloquist. There's no reason that they should. 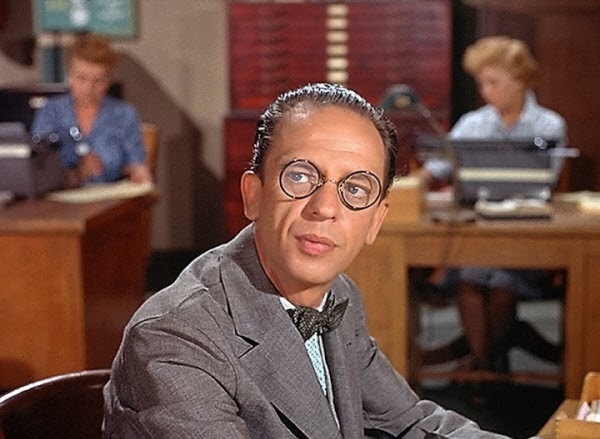 However, that information helps one to understand the outstanding performance that Don Knotts gives in a fabulous, sentimental animated film about World War II called "The Incredible Mr. Limpet" (1964), directed by Arthur Lubin for Warner Bros. It is December 1941, and the Japanese have just bombed Pearl Harbor. Everyone is rushing out to enlist, including George Stickle, the best friend of one Henry Limpet. Henry is a shy, retiring type who wouldn't hurt a fly, and the army decides it will win the war without his services. Despondent about being unable to enlist, clumsy Henry takes a long walk off a short pier at Coney Island and accidentally falls into the ocean. Henry Limpet, though, does not drown. Instead, he magically transforms into a tile fish, perhaps because he always has loved fish more than people. He is presumed dead by those he left behind, including bossy wife Bessie. Still wearing his signature prince-nez glasses, Henry meets and falls in love with another fish whom he names "Ladyfish." He also befriends taciturn hermit crab Crusty. Discovering he has a special talent, the ability to emit a booming roar that can be heard by sonar far away and also disrupt things nearby, Henry realizes that his misfortune might be of benefit to the US Navy. He finds a passing ship and asks to talk to George, who wound up in the Navy. 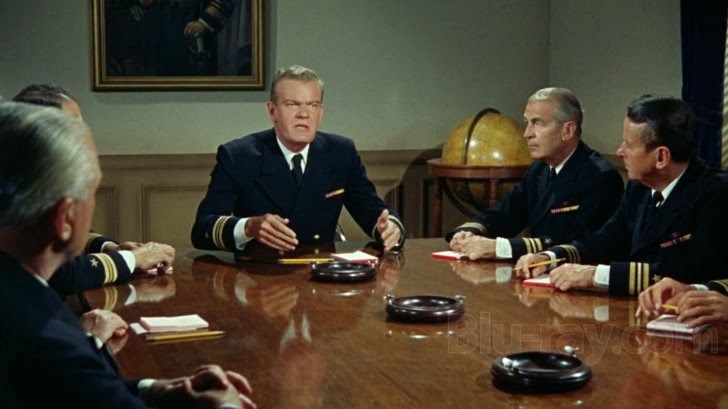 George is duly found, and together they hatch a plan whereby Henry will use his roar (which he calls a "thrum") to alert the US Navy to the location of enemy submarines. He "throws his voice," sort of like a ventriloquist - remember that bit of information from above? The US Navy accepts this wacky plan, and commissions Henry as an officer. Henry thus achieves his dream of serving his country during the war in a very roundabout sort of way. Things go quite well for a while, and Henry manages to direct US warships to sink predatory German submarines. Finally, however, the Germans catch on to what is happening to all their subs, and develop a cunning counter-measure designed to rid themselves of Henry and his "thrum" once and for all. Forcing a final showdown, they assemble a fleet of submarines and fire a bunch of torpedoes at Henry that hone in on his thrum. In dodging them, clumsy Henry accidentally loses his spectacles. Everything seems dire, but with the help of his friend, Crusty, and clever use of his thrum, Henry manages to redirect the German torpedoes away from him and back toward the very submarines that had attacked him. The entire German submarine fleet is sunk, achieving final naval victory for the Allies. With the war won, Henry swims back to Coney Island for a last reunion with Bessie. She gives him some new spectacles, he releases her as his wife, and George and Bessie fall in love. Henry, meanwhile, now is free to be with Ladyfish. 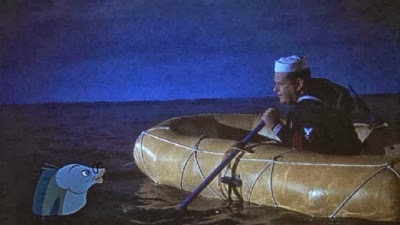 The film ends twenty years later, the time of the release of "The Incredible Mr. Limpet," with George once again seeking out Henry to help win new naval battles. 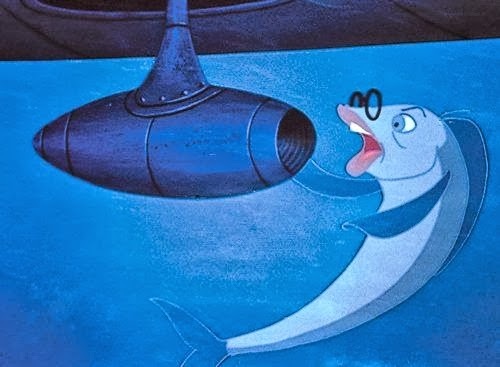 "The Incredible Mr. Limpet" was not intended to be screamingly funny, though it is amusing at times simply due to Don Knott's classic characterizations and the way the animated characters are drawn. At that time in his career, Knotts still was getting only minor roles in films despite his growing television fame - tv actors in Hollywood faced a very real stigma. A classic Don Knotts role from the period was as the unnamed "nervous motorist" in "It's a Mad, Mad, Mad, Mad World." 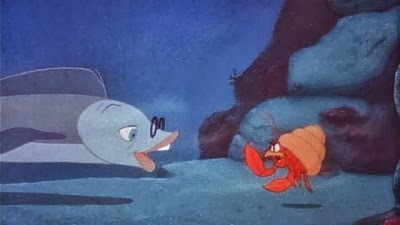 "The Incredible Mr. Limpet" enabled Knotts to show studio executives that, in his own funny way, he could play drama as well as slapstick comedy. The role of Henry Limpet was more of a breakthrough for Knotts than even many of his fans now realize, because they see "animated film" and think "comedy." 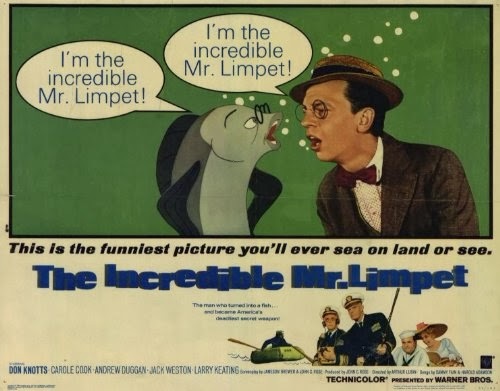 "The Incredible Mr. Limpet" is not a comedy at all. If you ever were to ask the enduring question, "Why did Don Knotts leave 'The Andy Griffith Show,'" the correct answer would be because of his success in showing his ability to act outside of comedy in "The Incredible Mr. Limpet." At this point, you might be saying to yourself, "Well, if Don Knotts isn't being funny, why would I see him in an animated film that is supposed to be funny like 'The Flintstones' is funny, but isn't?" Well, you should indeed see "The Incredible Mr. Limpet." Instead of his usual slapstick humor, Knotts shows true talent at creating an amusing, but also lovelorn and patriotic, character. It was quite a tour de force, one that nobody expected because it showed that, beneath the surface of the bumbling comic lay a very multi-talented and soulful man. He even sings! 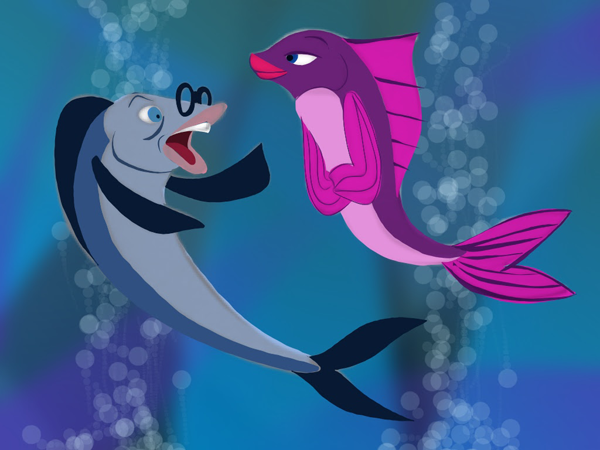 If you were to categorize "The Incredible Mr. Limpet," it would be as a partially animated romantic drama. That probably throws a lot of people off, because drama and romance are pretty much the last things you think about when the two concepts of Don Knotts and animated films come up. While Knotts was a funny man, he also was a serious actor and man who took himself seriously. Remember that part above about him being a real-life World War II hero? He felt he could be as convincingly romantic on screen as anyone, and that he could play a straight role as well as anyone. The two together? No problem. Audiences just needed to be convinced, and that was what happened with "The Incredible Mr. Limpet." The desire to play drama was a common feeling among comedians at the time, such as Don Knotts and Jerry Lewis, and their efforts along those lines often had very mixed results. 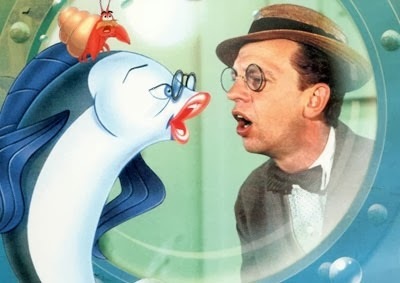 "The Incredible Mr. Limpet," however, is a triumph of advanced animation for its day, and Knotts plays his character with the extreme sentimentality that it merits. At times, you don't know whether to laugh while looking at the funny caricature of Don Knotts as a fish, or cry at the thought that he actually is saying a final goodbye to Bessie, forever. The idea of George going back out to sea to find Henry all those years later is brilliant, like going back to look for a long-lost comrade from the war who didn't make it. The under-appreciated stage actor Jack Weston stars as George, playing the sidekick role with skill. When George gets in a lifeboat to have a conversation with Henry, you really feel a bond between the two men. Everybody else in the cast is basically background, though Carole Cook as the brow-beating Bessie, Elizabeth MacRae voicing the romantic Ladyfish and Paul Frees as the crusty Crusty give pitch-perfect performances to complement the wayward Mr. Limpet. MacRae, incidentally, also eventually wound up in Mayberry, as Gomer's girlfriend. There are funny naval officers and ineffective Germans bumbling around that lighten up the proceedings and keep it from getting too real. Somewhat surprisingly, there is a not-bad soundtrack to the film, though you'll never be able to find it in any store nowadays. "The Incredible Mr. Limpet" is fondly remembered by true fans of animation, and actually remains quite enjoyable by modern children. They will be entranced by the terrific animation sequences and Knotts' nervous-guy act at the films' beginning. 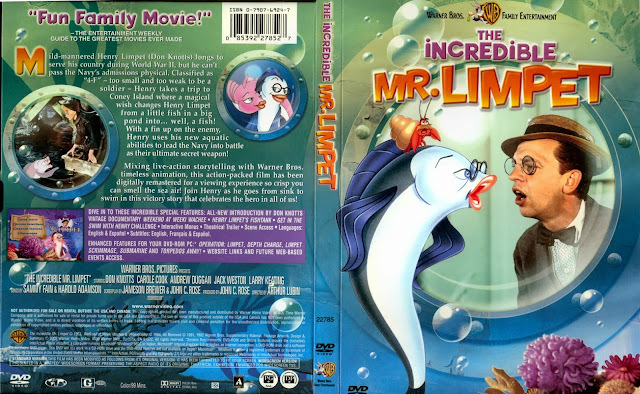 "The Incredible Mr. Limpet" is available on DVD and Blu-ray, the latter having been released in August 2012. A remake is planned, though it has been in development Hell for a decade and may well remain there for another decade. "Fun for the whole family," as they say. 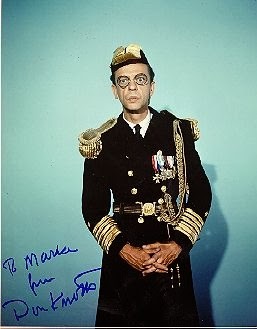 Autographed photo of Henry Limpet by Don Knotts. "The Incredible Mr. Limpet" gets our highest rating. It is a true classic, no matter how you define that. Directly below is a trailer for "The Incredible Mr. Limpet." Below that is a grainy copy of the incredible song "I Wish I Were A Fish," by Don Knotts.